Well friends, I have officially worked as a bank teller for a year. While that milestone is not a huge deal, it is something to remember. I have learned a lot in my year as a bank teller, and a lot of it will help me as I grow my music career. Some of the lessons I’ve learned are obvious: be a nice person. Others are not so obvious. Either way, I am going to talk about how my day job has helped my music career. In some ways, being a teller is a lot like being a private teacher or independent musician. You have to work with people, and you learn a lot while doing it. So, here are the biggest things I have learned as a teller that I will use in my music career. It doesn’t matter what career you choose, you need to be nice to everyone. This is especially true when you are first starting out. People know people, and they talk. While this isn’t always the case in banking, it is definitely the case in the music world. There are a lot of musicians out there vying for the same opportunities as you. One bad impression could cost you a job. So be smart when you make connections. Just be a nice person. It will make every part of your life easier, not just your career. 2. Know that You Won’t Please Everyone. There are some people that you just can’t please. They want things done a specific way or by a specific person. That happens in both banking and in music. I’ve had customers wait on another teller because they liked how s/he processed their transactions. I’ve had other musicians complain about a music group was being ran. Being a people pleaser is not always a bad thing, but it also won’t always be successful. There are going to be times when a customer, client, or colleague will not stop complaining. It could be about a huge problem, or it could be negligible. Just remind yourself that you can be the nicest person in the world, but you still won’t please everyone. 3. Focus on the Task at Hand. When you are working with other people, you need to focus on what you’re doing. One of the tellers at another branch was so engrossed in his phone that he didn’t pay attention when cashing what was a fraudulent check. If you are rehearsing without a conductor, you don’t have anyone there to keep you all on track. That’s your job as a group. When a customer comes up to you, or you have to teach a lesson, focus on that thing. Yes, emergencies do happen. It’s okay to step off to the side to take care of something. But not only is it unprofessional to lose focus, it is also rude. Sometimes, you luck out and your schedule doesn’t change at all. You know what you have to do and when you have to do it. But a lot of the time, you have to be flexible. Rehearsals get cancelled, you get called to take a gig last minute, and you need to be flexible. Things change, and people change. You might be prepared to have a lesson with a particular student, but the that student doesn’t show up. One day at work, you might be asked to come in early or stay late. Be prepared for change, and be willing to go with the flow. Not only will it make your life easier, but it will make people want to work with you more. Since I have a full time day job, I have to utilize my off time to practice, write for this blog, and work on other parts of my music career. Luckily, I do get all federal holidays off (and with pay), and I love having that extra day to dedicate to music and blogging. When you work as a musician, it’s also important to take advantage of your time off. Catch up with family and friends, find a hobby, or just enjoy not working. I know that musicians don’t always have time off, but try and give yourself a little vacation every now and again. I have learned a lot more through banking, like what to look for on a check (perfect for private teaching), but I wanted to focus on some of the bigger lessons. 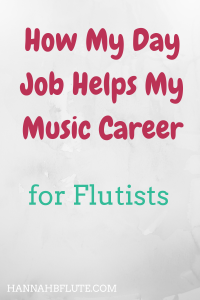 If you have learned anything in your day job that helps you as a musician, let me know in the comments! Previous Previous post: Should You Have a Website?